Yesterday’s post is the first in a study of verses from St Matthew’s Gospel which do not appear in the three-year Lectionary (‘the Lectionary’ for the purposes of this entry). I have completed a similar study on the Gospels of John, Mark and Luke in that order to encourage those unfamiliar with the New Testament to read them. These are available on my Essential Bible Verses page. I purposely held off with the first book of the New Testament — Matthew’s Gospel — because I found it difficult to read when I was younger. Some of my friends have also expressed the same opinion. However, the Gospel according to Matthew is undoubtedly the most complete account of our Lord’s earthly ministry. And, to the credit of the Lectionary compilers and editors, they leave comparatively little of it out in prescribed readings for public worship. In that sense, they are honouring the tradition of the first and second centuries of the Church, where Matthew was the pre-eminent Gospel (p. 2 of PDF). That said, for centuries, Bible scholars have been asking who wrote what when. My introduction to St Mark’s Gospel gave an explanation of how the three Synoptic Gospels fit together. Synoptic means ‘seen together’ as Matthew, Mark and Luke share many of the same accounts of Jesus’s ministry. St John’s Gospel differs, focussing on other episodes of His life, although it, too, follows a chronology of the essentials, particularly in relating the Last Supper, which is the fullest Gospel account, comprising several chapters. My post on Mark explains the theory held by many scholars, theologians and clergy of all persuasions that Mark was the first to be written. Luke and Matthew came in the decades following. However, Matthew is still the pre-eminent Gospel and appears first in the New Testament. If the early Church had to rely on Mark’s concise yet highly readable account, the end of which might have been lost, there might not have been so many Christians throughout the centuries. Before addressing what early Doctors of the Church have written, let us look at background information about Matthew (depicted above by Rembrandt, courtesy of Wikipedia). Unlike modern scholars, Christians who are faithful to Church history consider that the Apostle Matthew — Levi, when our Lord called him — is the author. Because he was a tax collector, he would have come in contact with not only the local Aramaic-speaking public but travellers as well. Therefore, he was also well versed in Greek. When he began his ministry, Matthew stayed in Judea. Later, he went further afield to preach to Gentiles as well as Jews. it is probable that there might be an edition of it in Hebrew, published by St. Matthew himself, at the same time that he wrote it in Greek the former for the Jews, the latter for the Gentiles, when he left Judea, to preach among the Gentiles. One of the obvious reasons is that the “Kingdom of Heaven” is mentioned over 30 times and never the Kingdom of God. This is because the Jews do not speak the name of God and this could be the very reason that Matthew used this phrase. There are many times while reading the book that an event happens and a prophecy is cited. The event is mentioned as the direct fulfillment of a promise made to the Jews by one of their Jewish prophets, and the fulfillment of the prophecy was happening before their very eyes. Indeed, we can see from the genealogy in Matthew 1 that the Apostle set out to prove to the Jews from the start that Jesus is, indeed, the long-awaited Messiah. His Gospel goes on to show that Jesus’s contemporaries rejected Him time and time again. do not believe in the miracle of prophecy. – Throughout, the King — Jesus Christ — came to His people and the people rejected Him. Matthew 28: the King commissions His Apostles to go out and preach. The more I read about the modern scholarship relating to the Gospel timeline the more inclined I am to return to the earliest sources, the Doctors of the Church, for their verdict. I also question exactly why scholars from the 18th century — if not before — to the present day would wish to come up with an alternative verdict on the Gospels. Even a less detailed reading of their hypothesis reveals many dismissive comments about our early theologians’ scholarship. Since the church fathers lived much closer to the time of the composition of the gospels and were scholars in their own right, their testimony must be given serious consideration in any hypothesis regarding chronological order. Such early testimony stands in direct contradiction to the predominant contention of source criticism that concludes for the Two- or Four-Document Hypothesis (i.e. priority of Mark and Q), especially since the latter is not a product of objective historical analysis but a late-blooming conjecture spawned by Enlightenment ideologies. In Farnell’s exposition of the writings of our Church fathers, it seems that only one, Papias, entertained the possibility — and it was only a possibility — that Mark could have been written before Matthew. Papias was the bishop of Hierapolis, a city located between Colosse and Laodicea in Asia Minor. He was a disciple of the Apostle John, so would have had first hand knowledge from him as to what the other Apostles were doing. Papias’s written works date from 95 to 110 AD, therefore, crucial to what was happening in that era (p. 4 of PDF). Unfortunately, his works no longer exist, and what we know of them has been cited by other Church fathers. And the Presbyter [John] used to say this, ‘Mark became Peter’s interpreter and wrote accurately all that he remembered, not, indeed, in order, of the things said or done by the Lord. 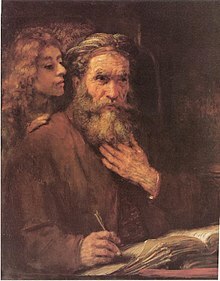 For he had not heard the Lord, nor had he followed him, but later on, as I said, followed Peter, who used to give teaching as necessity demanded but not making, as it were, an arrangement of the Lord’s oracles, so that Mark did nothing wrong in writing down single points as he remembered them. For to one thing he gave attention, to leave out nothing of what he had heard and to make no false statements in them.’ This is related by Papias about Mark. Gundry concludes that, from this, Papias was explaining that Matthew brought ‘order’ to Mark’s Gospel and wrote a fuller history. Farnell, however, doubts that taking random quotes from Papias — as Eusebius did — hardly proves the Markan primacy hypothesis. And nothing is in evidence that Papias — or Eusebius — sought to actively disprove Matthew’s Gospel as being the primary one. I would recommend Farnell’s paper to anyone interested in the Church fathers and Matthew’s Gospel. Catholic Answers has three main quotes from these early theologians. These also appear in Farnell’s paper. For our purposes, we discover that everything we have had for nearly two millenia as Gospel manuscripts have been copies written in Greek. Although we do not find a chronology there among the writers, we can be sure that the authors of the Gospels are as named in the New Testament. Among the four Gospels, which are the only indisputable ones in the Church of God under heaven, I have learned by tradition that the first was written by Matthew, who was once a publican, but afterwards an apostle of Jesus Christ, and it was prepared for the converts from Judaism and published in the Hebrew language. (Commentaries on Matthew [cited by Eusebius in History of the Church 6:25]). Matthew had begun by preaching to the Hebrews, and when he made up his mind to go to others too, he committed his own Gospel to writing in his native tongue [Aramaic], so that for those with whom he was no longer present the gap left by his departure was filled by what he wrote. (History of the Church 3:24 [inter 300-325]). Let us bless God that we have it, and have it in a language we understand. These four gospels were early and constantly received by the primitive church, and read in Christian assemblies, as appears by the writings of Justin Martyr and Irenæus, who lived little more than a hundred years after the ascension of Christ they declared that neither more nor fewer than four were received by the church. A Harmony of these four evangelists was compiled by Tatian about that time, which he called, To dia tessaron—The Gospel out of the four. In the third and fourth centuries there were gospels forged by divers sects, and published, one under the name of St. Peter, another of St. Thomas, another of St. Philip, &c. But they were never owned by the church, nor was any credit given to them, as the learned Dr. Whitby shows. And he gives this good reason why we should adhere to these written records, because, whatever the pretences of tradition may be, it is not sufficient to preserve things with any certainty, as appears by experience. For, whereas Christ said and did many memorable things, which were not written (John 20:30,21:25), tradition has not preserved any one of them to us, but all is lost except what was written that therefore is what we must abide by and blessed by God that we have it to abide by it is the sure word of history. Thanks for putting him back! I get sick of hearing, “the writer of Matthew'” or “the writer of John” as if we were clueless as to their origins and had no idea! So do I. It’s awful. The Wikipedia article on the Gospel of Matthew is particularly poor in this regard. It’s depressing to read. I have a question on authorship that you might be able to answer for me. Who wrote the letter to the Hebrews? I really like that book and it is bothersome that the research online I’ve seen concludes: ‘Scholars do not know who wrote it’. It’s appalling that modern scholars ignore the Church fathers, who were so much closer to the era. Some of Satan’s finest work involves getting us to doubt and disregard these men.